Led by scientists at Pacific Northwest National Laboratory, researchers combined experiment, computation, and theory to discover new insights about green fluorescent proteins, which, when added to viruses and proteins, brings their life and function into view. The research was featured on the December 14 cover of The Journal of Chemical Physics. Reproduced with permission of AIP Publishing. A substance squeezed from a jellyfish found off the western coast of North America has transformed modern cellular biology. The substance is green fluorescent protein (GFP), which, when added to viruses and proteins, brings their life and function into view. Now, by combining experiment, computation, and theory, scientists at Pacific Northwest National Laboratory and colleagues at Louisiana State University have discovered new insights about GFP's behavior. This in turn can lead to even more ways to exploit this valuable monitor of biological processes. By adding a few water molecules to the GFP chromophore—the part of the molecule responsible for its color—the scientists simulated crystallographic water molecules in GFPs. When water is added, the excited state that generates fluorescence is more stable. Water apparently shuts the channel to electron emissions, effectively shutting off electron autodetachment competition and allowing fluorescence. The scientists' findings provide a more accurate understanding of this extremely useful protein. 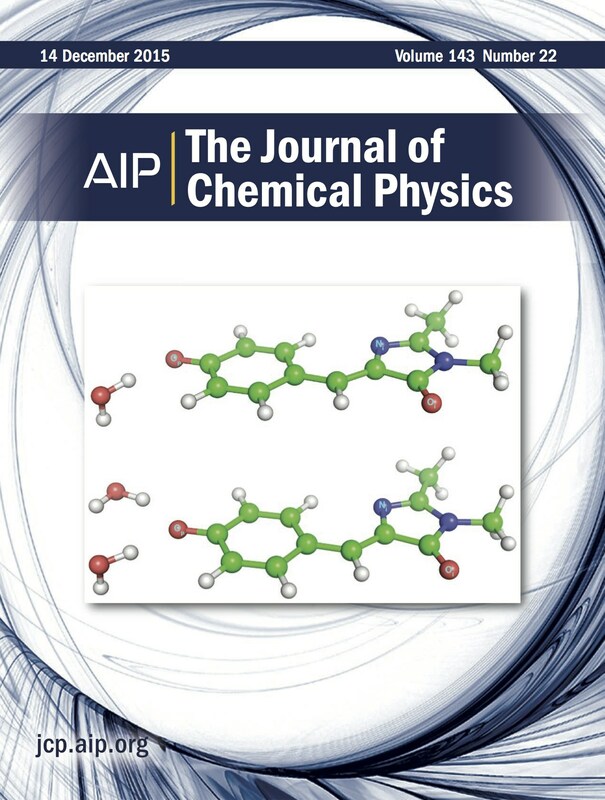 The two water molecules shown on the December 14 cover of The Journal of Chemical Physics make a huge difference in the behavior of the GFP. In turn, this can lead to eventual control and manipulation of processes where GFP is used. Why It Matters: GFPs (see sidebar) are invaluable as markers for monitoring processes in living cells, such as in cancer research, where GFP-labeled cells model how cancer spreads to organs. Their versatility and value has led to the synthesis of new types of GFPs with different colors and new classes of photoactivatable fluorescent proteins for use in ultra-resolution imaging and optical data storage of raw data images from living cells and tissues. The photophysics of GFP and its chromophore depends on its local structure and environment. Despite extensive experimental and computational studies, many open questions remain about the key fundamental variables governing this process. One question is what controls the efficiency of light emission. When GFP absorbs light, only some of the energy is converted into a fluorescent signal, with the rest being lost by a process known as relaxation or deactivation. The fraction of energy emitted as fluorescence versus that lost by relaxation dictates GFP's efficiency. What the PNNL and LSU scientists wanted to know was how the protein's internal environment—in this case, water—affects specific types of relaxation. "We know the relaxation that competes against the fluorescence is critically dependent on the GFP chromophore's local environments, but we don't fully understand the details of why it happens," said PNNL chemical physicist Dr. Xue-Bin Wang, senior author of the article. "If we get rid of surrounding molecules by using the gas phase, the fluorescence goes away. And in solution, no fluorescence occurs at room temperature. But fluorescence returns at low temperatures. Is it caused by the intrinsic electronic structure properties of the chromophore in the protein? Or is it caused by other molecules in its environment? Our results showed it was the latter." A Nobel-Worthy System: GFP is centrally important to modern cell biology. Its discovery and development garnered the 2008 Nobel Prize in Chemistry for scientists Osamu Shimomura, Martin Chalfie, and Roger Tsien. Gaining a fundamental molecular understanding of how GFP works can lead to the ability to control, engineer, or manipulate systems for new applications, such as biosensors, or for advanced imaging. By Raymond Keller, under auspices of Crystal Protein. Licensed under Public Domain via Wikimedia Commons. Enlarge Image. 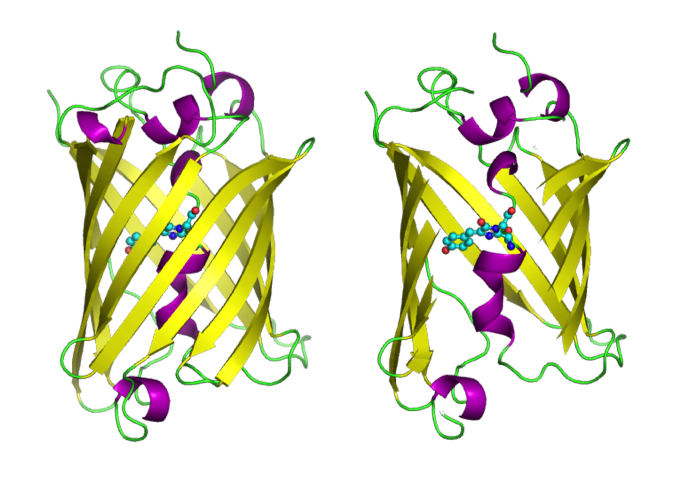 In the cartoons shown here, the GFP molecules are shown in full (left), and with the side of the surrounding barrel cut away (right) to reveal the chromophore, which is highlighted as a ball-and-stick model. Fluorescence arises when a molecule absorbs certain colors of visible light and then reemits a different, lower energy color. The interactions of the chromophore with its surroundings will dramatically affect the fluorescent properties of GFP, such as the color or intensity of the fluorescence. Researchers are currently trying to understand the underlying physics of these processes. By adding water and comparing the computation with experimental results, the scientists could determine that their theory of the molecules' structure was accurate. Methods: The team combined negative ion photoelectron spectroscopy (NIPES) with theoretical calculations to create a probe to identify the exact conformers of clusters of the p-hydroxybenzylidene-2,3-dimethylimidazolinone anion (HBDI-), a model of the GFP chromophore. They used NWChem, an open-source computational chemistry software package supported by the Department of Energy (DOE) Office of Biological and Environmental Research (BER) and developed at PNNL with unique capabilities regarding excited states and structure characterization, and the supercomputer Cascade, at EMSL. In a previous study by Wang and collaborators at the Chinese Academy of Sciences, the GFP chromophore itself was studied in the gas phase. In the current study, the scientists took another step farther by adding the water molecules. The notable addition was the use of advanced computer simulation techniques developed in collaboration with LSU. "In the current paper, the important component was coming up with an accurate theory. In an experiment, when we obtain a signal, we don't ‘see' what is happening. Computer simulations using NWChem and EMSL supercomputing resources, give us the necessary details," said co-author Dr. Karol Kowalski. "It's a puzzle," said computational scientist Dr. Marat Valiev, one of the co-authors. "You can't interrogate the protein system as a whole to obtain key molecular-level parameters governing photoresponses of GFP. We have to disassemble it piece by piece, examine each piece, and then put it back together, which is best approached through combining experiment and simulation." What's Next? The scientists showed that the first few water molecules progressively stabilize the excited state of the chromophore. "This could be an important role of water molecules in GFPs that has not yet been fully explored," said Wang. Sponsor: This research was supported by DOE, Office of Science, Office of Basic Energy Sciences, Chemical Sciences, Geosciences, and Biosciences Division. This material is based upon work supported by the U.S. Department of Energy under EPSCoR Grant No. DE-SC0012432 with additional support from the Louisiana Board of Regents (W.A.S.). Research Team: Kiran Bhaskarah-Nair and William A Shelton, Louisiana State University; Xue-Bin Wang, Marat Valiev, Karol Kowalski, and Shihu Deng, PNNL. In one sentence: By understanding the underlying physics of the fluorescent behavior of GFP, scientists will be able to further exploit it as an essential tool for unraveling molecular-level details of processes in molecular biology and genetics. In 123 characters: A combined approach gives insights about GFP that will lead to new ways to exploit this key monitor of biological processes. Green fluorescent protein (GFP), which comes from the jellyfish Aequorea victoria, is made up of 238 amino acid residues, but it is the interaction of three sequential amino acids that make up the key active, fluorescing region of the protein. These three amino acids, serine-tyrosine-glycine, undergo a series of post-translational rearrangements to create an extended system that gives GFP the ability to absorb and emit light in the visible region. However, the other 235 amino acids are essential because they form a barrel-shaped structure that protects the chromophore (region responsible for a molecule's color) and allows it to maintain its fluorescent properties. The interactions of the chromophore with its surroundings will dramatically affect the fluorescent properties of GFP. For example, interactions of specific solvent molecules and chemical modifications can change the color of the fluorescence and reveal the nature of the local environments. Researchers are currently trying to understand the underlying physics of how such interactions affect the fluorescent properties of GFP and its variants.